DPAC banner carriers, thank you Emma! About a year ago, on 3rd October on a very rainy day, disabled people came to Birmingham and lead the protest against the Tory party conference in anxiety and anticipation of the Comprehensive Spending Review. Even then we were sporting tee shirts which said Cuts Kill. Disabled people, carers, their families, allies and friends were aghast at the savage onslaught in spending cuts on services, benefits so called proposed reforms on disability living allowance, the NHS and where human rights of disabled people have been whittled away by humiliating and stressful assessments by French IT company Atos awarded 100 million £ on work capability assessments.40% of tribunal appeals are won rising to 70% when people have representation, four out of 10 of those who appeal against the decision by Atos are successful, a process that costs the taxpayer £50m a year. Disabled People’s dignity was also seen to be undermined by disallowing support for the most basic human function – going to the loo. Elaine McDonald was told to use incontinence pads when she was not incontinent. Most recent EHRC report showed that in the UK disabled people “face harassment, insult and attack almost as a matter of routine, while a collective denial’ among police, government and other public bodies means little is done to challenge the situation”. We are horrified by the growing number of cases such as Fiona Pilkington, David Askew, Keith Phillpot, ShaoWei He, Christopher Foulkes, and others – they were bullied, harassed, tortured and even murdered. In this culture and backdrop where tax dodgers get away and the highest salaried continue to get obscene bonuses and pay offs, the tabloid media portrayed with connivance from the Condem govt disabled people as scroungers, frauds and work shy. They want to ‘help’ us to appreciate the value of work by penalising those who truly cant work and close up jobs for those who are in work – such as those working in Remploy factories – such as our comrades here marching today. We have many disabled people in despair – who feel hounded, penniless, homeless where benefits have been cut, local authority support slashed. Many feel suicidal without legal aid to fight back. Do not forget that disabled people come from many backgrounds and communities – many are women ( whose jobs were the first to go from the cuts, and services such as domestic violence support were cut and CAB services), disabled people also from BME communities and disabled people who might also care for other disabled, elderly parents and or they are themselves single parents. None of the political parties have a care for us. 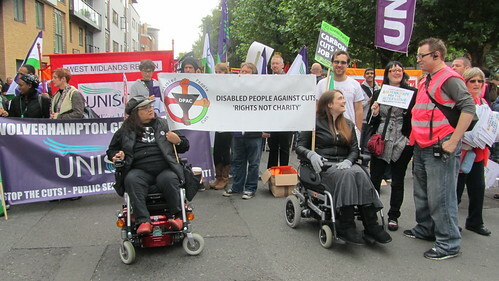 Disabled people are now working and campaigning with trade unionists – DPAC was first involved with Right to Work Campaign who initiated these demos. We have supported each other – in our fight against Atos, on 30th Sept disabled people and their allies will have a day of action against Atos all over the country, we will be there at the March in Manchester on 2nd October and we will be supporting the call for strike action on the 30th November. We will fight back inspite of everything – we might be deemed vulnerable and weak but we are not powerless, we will continue our fight and resist to the end. Last week in parliament we witnessed another move towards the realisation of Iain Duncan Smith’s dream and the arrival in the UK of a Wisconsin style welfare system. What IDS sees as his dream of reform of the benefits system any thinking person would see as a nightmare. IDS says these reforms are necessary to make work pay. DPAC say raise the minimum wage to a living wage and tell us where the imaginery jobs for over 1 million young people and almost 1.5 million unemployed disabled people are. The employment rates for disabled people are 48% compared with 78% for non-disabled people, and only 20% of disabled people with a mental health condition are in employment. This is because of the barriers they face in getting and keeping jobs not because they’ve made a life-style choice not to work. DPAC believe neither Disabled People nor Disabled Children should pay the price for welfare reform, nor should anyone anyone else – neither pensioners, single parents, or unemployed people. As we aren’t millionaires at some time in our lives every one of us will need the welfare state. This crisis wasn’t caused by us and the so-called pension’s crisis isn’t caused by an ageing population, but rather by a set of ideological values. There is always plenty of money available to bail out bankers, fight wars and build unusable nuclear weapons. It is a choice what to spend on, not something that is inevitable. The introduction of a Universal Credit to replace existing means-tested benefits and tax credits for people of working age from 2013. this includes slashing funding for child care costs, and ending universal entitlement to child benefit. The introduction of Personal Independence Payments to replace Disability Living Allowance with a stated aim of reducing the number of claimants by 20%. If you have an imaginary wheelchair ie if you don’t qualify for one from the NHS but might be able to use one if you did, then you are going to be found capable of mobilising and lose entitlement to Disability Living Allowance. The removal of the Mobility component of Disability Living Allowance from all residents of care homes, resulting in a fall in their incomes of 66% and leaving them £22 a week for all additional costs. Many disabled people use this money to purchase wheelchairs or mobility scooters. Will disabled people be tipped out of their wheelchairs enmass as they lose their entitlement to this benefit.? For many also this funding is the only way they are able to keep in touch with their families and friends, Disabled people will effectively become prisoners in their care homes, and even further isolated from society. The proposed abolition of the Independent Living Fund coupled with the reduction of local authority funding will result in massive numbers of disabled people losing their right to live independently. in total contradiction to the UNCRPD which was ratified by the UK government. This fund should not be scrapped without an adequate and ring-fenced alternative being put in place. In other countries where similar moves have been made the costs to the state increased as large numbers of disabled people ended up being admitted to hospital for lengthy periods of time. This proposal in particular will be disastrous for disabled people’s rights. Restricting the amount of Housing Benefit entitlement to social housing tenants whose homes are larger then they are deemed to need is ill thought out as many disabled people have had costly adaptations made to their homes which they would lose if forced to move. There is also a massive lack of accessible properties available anyhow thus making it almost impossible for disabled people to find alternative accommodation. Further for anyone with a visual impairment or a learning disability it is often vital for them to remain in surroundings that they are familiar with and to maintain contact with medical and other professionals who know them well. Another potential problem with housing is that the bill will link Local Housing Allowance rates to CPI index, which excludes housing costs. Already with the changes to LHA made it is becoming increasingly difficult for disabled people who have additional housing needs eg. to use a wheelchair, or have non-resident carers to find accommodation they can afford in the private rented sector. Limiting of Employment and Support payments to 12 months for those in the Work Related Activity Group seem particularly illogical as disabled people’s impairments are not likely to go away and may in fact deteriorate. It ignores the effects of chronic, fluctuating conditions such as MS, ME. While we welcome the Lib Dems vote yesterday not to support this we aren’t hopeful that this will make any real difference. The Social Fund has enabled people to but essential appliances for the home that they would otherwise be unable to afford, such as a washing machine, a bed, a cooker. The government plans to abolish this fund and replace it with a loan that the applicant will pay interest on. Millions will be forced into enormous debt on very low incomes. That cannot be considered fair especially when you look at what claims MPs make for furniture which is not essential. Caps on the total amount of benefit any claimant can get, for both housing needs and living expenses. The suggested total amount is £500 per week regardless of family size, or costs of housing. This titally ignores the excessive levels of rent in many parts of the country due to the total lack of regulation of the private rented sector. Many families with disabled children will face a cut to the financial support they receive. The new system will result in these children losing up to £1400 per year The Government estimates that 100,000 disabled children would lose out under this change. Finally tied into the localism bill this Welfare abolition bill will end any automatic right to Council Tax benefit and who can and does get CTB will be up to each local authority to decide. Finally this bill will bring in new sanctions including loss of 100% of benefit for up to 3 months for disabled and non-disabled claimants who fail to jump through the right hoops to find non-existent jobs. For anyone on Job Seekers Allowance if they refuse to take part in unpaid mandatory work programmes, otherwise what can only be deemed to be forced or slave labour then payments may cease for at least 3 months. This is not reform but together with the wholesale privitisation of the NHS,including Blood Transfusion and Transplant services the total destruction of the welfare state as we know it. We cannot allow this to happen. So far we’ve marched and protested, frequently over the last 12 months, and there have been riots in many towns and cities, yet the Condems still don’t listen, If we have any chance of saving the services, jobs and futures we need, now we have to find other ways to make our views known. DPAC fully support the November 30th strikes and since we’re to have a Wisconsin style welfare state perhaps we should also have Wisconsin style occupations of local and central government offices. Punishing disabled people, couples that separate, their children and destroying their futures is not going to help anyone, least of all the tax payer who will end up picking up the tab for increasing health issues that result, the additional costs of homelessness and a generation of children with no prospects and no hope. Thousands of people have joined the TUC ‘Birmingham for the alternative’ march on the Lib Dem conference in Birmingham today. archers were angry at the role the Lib Dems have played in propping up the Tories in office. From Fees to Academies to cuts, no matter what the issue, the Lib Dems are helping the Tories drive through their policies of privatisation and cuts. In 2 weeks time thousands more will gather to march on the Tory conference. On 30th November up to 3 million public sector workers will strike against the ConDem attacks on pensions. URGENT – Late Update from TUC re- static Birmingham protest outside ICC for disabled DPAC OPENS TO MEMBERS!